FCP Euro announced today that it will import Mann filters auto parts on behalf of its customers to their e-commerce website. 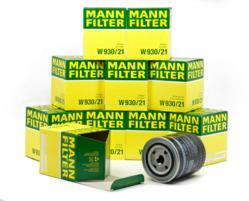 Mann filters, an accepted leader in OEM filters for Mercedes, BMW, Porsche, Audi, Volkswagen, Saab, Volvo, and others, is a leading supplier of the international automobile industry since 1941.The addition of the Mann filter catalog to the FCP Euro lineup will allow the company to provide an even greater degree of choice for its customers and will further demonstrate FCP Euro's commitment to providing the best products at the best prices in the online auto parts industry. FCP Euro president Nick Bauer announced today that the company will import the Mann filter catalog for sale through the FCP Euro website. Mann filters are highly respected throughout the automotive world; their quality is so well known that they have been chosen by a variety of European manufacturers to supply original equipment parts for their automobiles. Now, for the first time, FCP is adding the Mann parts catalog to the FCP Euro website. Mann filters are known for their extensive product range, including, Mann oil filters and Mann air filters, both of which are part of the many fuel saving tips offered on the FCP blog. Mann’s OEM parts for Mercedes, BMW, Porsche, Audi, Volkswagen, Saab, Volvo, and other European-made cars are manufactured to the highest standards of quality in the automotive industry. By importing this line of Mann parts, FCP Euro can ensure that its customers enjoy the best possible prices when purchasing these outstanding filters. FCP Euro specializes in providing the most comprehensive array of OEM and aftermarket auto parts for Volvo, Mercedes, BMW, Volkswagen, Audi and other quality European imports. ASE certified staff members are available to assist customers in selecting and installing the parts sold through the FCP Euro website. This commitment to customer service allows FCP Euro to provide the best possible shopping experience for consumers who visit the company's online auto parts store.